It's almost October....time to get the Halloween decorations out! 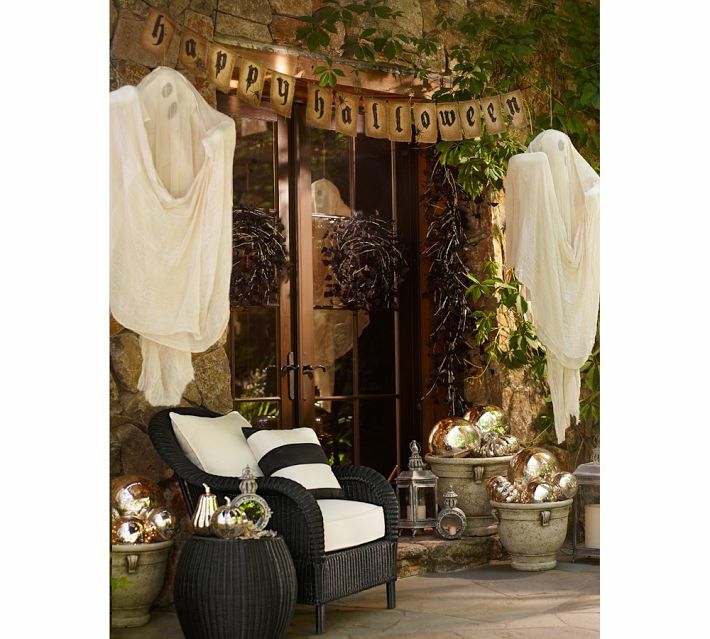 I was checking out Pottery Barn Halloween decor and ran across these fabulous ghosts. It made me think of the ghosts I used to make years ago. I was a stay at home mom looking for ways to make a little bit of money. I decided to make some ghosts and see if I could sell them to a little boutique not far from me. They were a big hit, I would take a dozen ghosts at a time and she would call me back in a couple of days to see if I would bring in more. These little ghosts can sit on a table or shelf and are a much smaller scale than the PB version, but are still cute and fun to make. Wrap two pipe cleaners together to make them more sturdy. Bend into shape shown. This will be the arms of the ghost. The dip in the center sits in the canning jar. Blow up balloon and set in the jar opening with the pipe cleaner arms. Cut a piece of cheesecloth (approximately 1yd.) and drape as shown, leaving plenty to puddle at base. The cheesecloth comes packaged like this, with the edges in the center. Refold it like this, with the fold on one side and the edges together on the other side. ....so it looks like this. Squeeze some of the starch out, but leave it pretty wet and drape over the jar/balloon/pipe cleaner. Adjust the draping and base then walk away and let it dry. After it has set for awhile it will become stiff enough that you can use a hair dryer on the base to speed up the process. First, cut - "Boo"- using the Vagabond and Gothic Boo Alterations die out of chipboard. Can I just say I'm so exited to use my new Vagabond Machine, it is so fun and easy to use!! Paint with two coats of Pitch Black Dabber Paint and let dry. Love the sanding tool, it makes sanding so much easier. Tie with jute, ready to attach to ghost. Cut "spooky" using Word Play Sizzix die and glue to flags. Trace around letters with a brown pencil to make letters stand out. Distress flags with a little Vintage Photo Distress Stain. Staple flags to heavy string. With the banners made we can go back and see if the ghosts are dry. If dry pop the balloon and remove the jar and pipe cleaner arms from under the ghost. Attach the banners to ghost. Thread the jute or string into a large eye needle and run through "hands" area in cheesecloth and tie with knot or bow. Love that you can see through them! Although we don't celebrate Halloween here in OZ, these are the cutest Ghosts I've see so far this year :) They look so easy to make too! Spooky cute!! I think this may be right up my alley! adorable..I a might have to make a few of these ...I love halloween decorating..so fun! oh... my... dear... goodness!!!! I am in love with these ghosts! Halloween is my birthday so, obviously, it is my favorite holiday/time of year. I so have to make these!! thanks! What an adorable little ghost...love it! Thanks for the tutorial! Cutest little guys I've seen in a while. Thanks for the tutorial. I LOVE THESE DEB!!! Halloween is my most favorite holiday and these are adorable! Now I have an excuse to buy the Boo die cut!! Thanks for sharing, as always. These are fantastic Deb! Great idea. The ghosts are a great idea. Thanks for sharing this spooky recipe so we can cook up a few of our own. When I first looked at the photo I wondered where you got those great ghosts. I have no kids and I'm still excited to make these! Very cute...the display is even better in person than the pictures show! You have motivated me to dig out the cheesecloth and canning jars and bring back the ghosts. They will be so cute with the pumpkins I am working on! Thanks for the motivation! Love the addition of the banners! SO CUTE! FABULOUS!!! It's been forever since I've even seen starch! Love the banners as well...wow!!! Oh these are spookilicious.....sooooo cute, thanks for sharing! What a fantabulous idea, Deb! Gonna have to give this one a whirl! Although I'm not a huge fan of Halloween, these little ghosts are sooooo cute that I've got to make a couple! Thanks so much for the tutorial, Deb. THanks for teh awesome instructions. Thank you for a fabulous tutorial! I remember making these years and years ago. what fun memories. These are so cute Deb!! Love them! Love love this idea. thanks for sharing! Just adorable, thanks for showing us the way! Simply inspirational. Thank you so much for showing how the piece is achieved. WOW! Fabulous! I will have to TRY these!!! lovin' how cute they are...thanks for the instructions!